Ajahn Thoy of is a young but powerful and renown magick master. Especially amongst foreigners he has become the Ajahn of choice but also many locals alike seek his help on a daily basis. His Samnak even on a week day has people out waiting to see him. He is renown for his SakYant skills. Sak Yant are Spiritual Tattoos renown for their very powerful spiritual effect. Sak meaning to tap or poke and Yant coming from the Sanskrit word Yantra. I have seen first-hand people going into a trance or possession while Ajahn was chanting blessing them after tattooing, honestly I don’t’ think they were faking it. I myself have felt the power of his Sak Yant and it is something that is hard to explain, except to say it was a powerful experience. For those of you that are new to Thai magick and haven’t heard of the Lersi/Reusi, let me give you a short Synopsys. Reusi is a mystical figure in Thai and Indian magick. In Sanskrit they are known as Rishi. These individuals are well known for powers developed in the areas of mind development such as telekenisis, levitation, precognition, telepathy, teleportation and creating herbal medicines, as well as other spiritual endeavours. Lord Buddha himself received teachings from the Rishis. The word Rishi conjures the image of mysterious hermit-like persons who live in solitary existences and dwell in caves, the forest or in the mountains. 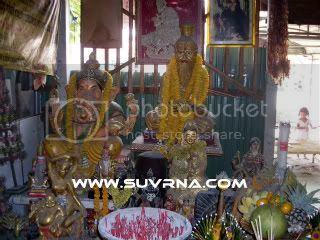 Rishis are credited for creating some of the Vedas and being the founders of ancient magick in Thailand. The Thais have ancient lineages of these the Lersi going back thousands of years. They renown in Thailand for their healing powers, knowledge of ancient herbal medicine, amulets, charms, sak yant and performing very strong magickal work. The Thai Lersi is an interesting amalgamation of Thai and ancient Indian culture. Many a Lersi give prominence to Shiva, Kali and other Hindu gods besides of course the Buddha. Ajahn Thoy is a modern day representation of this group of individuals and he regularly channels one of the ancient Reusi’s to help people and to perform Sak Yant. Ajahn Thoy has his hut/Samnak at the back or actually on the left of the Ubot (Main building where the Buddha shrine is). It’s in a very simple setting. Ajahn arrives at 12pm almost every day and everyone greets him with respect. Then he does his prayers and starts his work helping people. These amulets are from his Samnak when I visited. They are very popular in the amongst amulet collectors and Ajahn Thoy fans as well as Lersi fans. 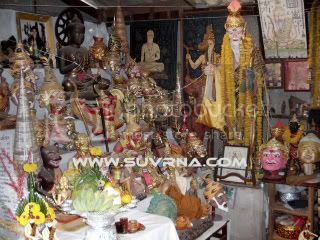 Ajahn Thoy's main shrines at his Samnak in Thailand.